Most people understand the word “aloha” as a Hawaiian greeting, but that isn’t the only interpretation. Aloha is hello, but it also means love, peace and compassion. And Moki’s Hawaiian Grill makes sure its customers feel every aspect of this welcoming phrase through its cuisine and atmosphere. The surprisingly spacious restaurant is located on 4386 S. Redwood Road in Taylorsville, a short five-minute drive from the Salt Lake Community College Redwood campus. 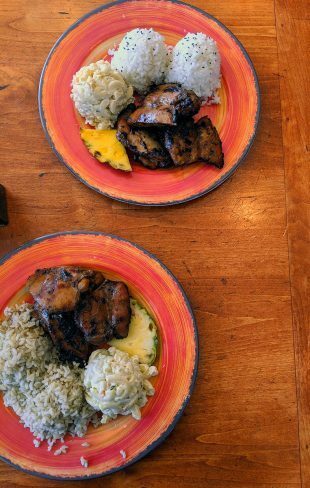 It offers all the typical Hawaiian cuisine you would come to expect: teriyaki chicken, kalua pork, pineapple, rice, macaroni salad, poke, and more. Having only tried Hawaiian food once before, I was skeptical of Moki’s. It didn’t seem to be anything spectacular or interesting. I’ve had teriyaki before, I’ve had poke before, I know what pork is and I don’t particularly love pineapple. Hawaiian food wasn’t something that I thought I’d have a craving for, since I can get a piece of it pretty much anywhere. I was dead wrong. What makes Moki’s special, and Hawaiian food in general, is that it isn’t just one aspect of each of those dishes. It combines the sweet and savory flavors of Asian cuisine with the heartiness of American cuisine, while still using traditional ingredients to make it wholly their own. It’s a wonderful blend that isn’t truly explored elsewhere as successfully. I had the luxury of trying Moki’s teriyaki chicken plate. It was three chicken thighs, cooked, marinated and served perfectly warm. Sides included two heaping spoons of brown rice and a signature macaroni salad, made with sweet pickle relish. It also came with a slice of fresh pineapple, which was a nice touch. The chicken was phenomenal. The teriyaki sauce was sweet, with exactly the right amount of saltiness to compliment it. The brown rice, was, well, brown rice. Macaroni salad isn’t usually my go-to, but I decided to take a chance on it since it was apparently a day of taking chances. I’m glad I did. It married the sweet pickle relish with a creamy sauce through every single noodle and bite. Not only was the food delicious, but they also provided top-notch service. I had my order within three minutes of sitting down after ordering at the front. The staff was welcoming and excited to share their favorite dishes with me. It truly is the perfect place for a quick bite in between classes or if you’re in a rush. 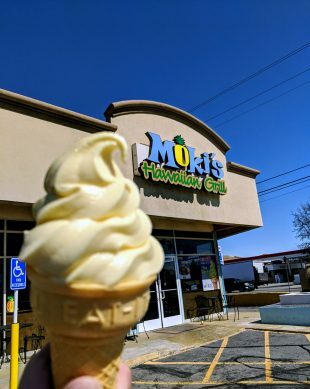 I was also told that if I went to Moki’s I had to try their “Dole cone” — apparently a staple of Hawaiian desserts. Essentially, it’s a soft-serve pineapple sherbet ice cream cone. It doesn’t really seem like anything special until you have your first lick. If you have ever been on a beach somewhere tropical with a cold drink in your hand and your toes in the sand, then you know how a Dole cone will taste. With the seemingly never-ending winter that has plagued the Salt Lake Valley, it provided a much needed reminder of summertime. Moki’s is more than what it seems in every aspect. It’s a small business with only a couple locations and a short history, but its inspired dishes, fast service and big heart would remind you that sometimes being the little guy is better. 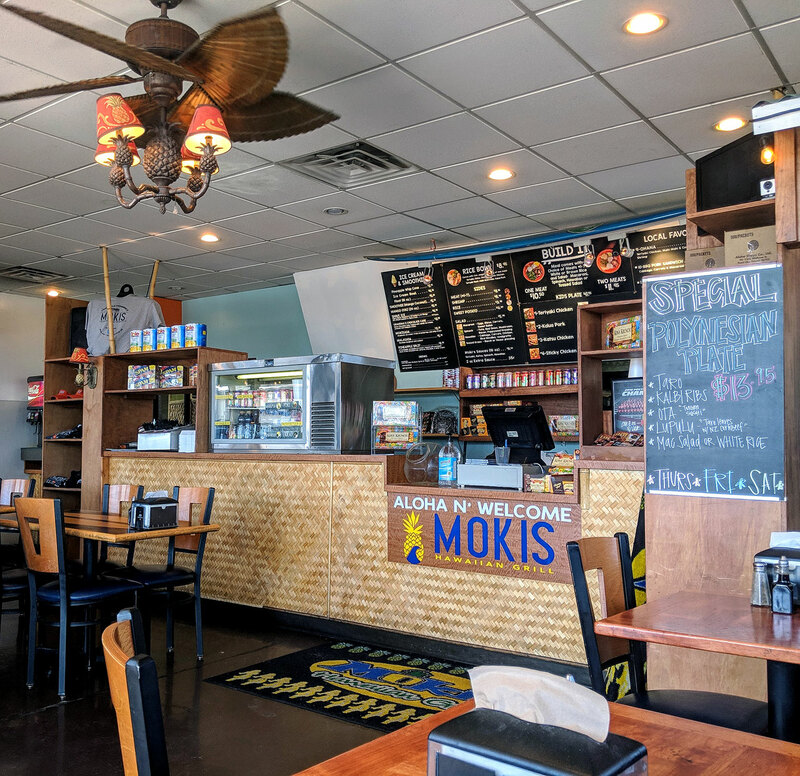 If summer is calling you, if you have half an hour in between classes, or if you’re just in the mood for some tasty island grub, say “Aloha!” to Moki’s.